Full face snorkel masks have made a real impact on the snorkel mask market in the last few years. They also opened the activity up for many new people as they allow to breathe more natural with your face under water. These new types of snorkeling goggles are not only for beginners. What makes them such a great device is that they don’t require a learning curve. You continue to breathe as you would on land and that’s about it. 6.1 Does your face stay dry? 6.2 Can You Wear Prescription Glasses? 6.3 Is there any resistance when breathing through your nose or mouth? 6.4 Is it easy to travel with these masks? 6.5 How do you wear it? 6.6 Can you wear it with a beard? 6.7 Can you talk while wearing it? 6.8 Can you clear it like a regular mask? 6.9 What else do you have to consider? 6.10 Can you wear them to swim laps? All these masks promise to have a 180 degree view in every direction. When you try them out you see that this is a little more marketing talk than reality. While they provide a huge field of view, they do not provide a full view in every direction. You will see the frame of the mask around the edges of your visible spectrum. This is much better than a standard set of goggles but it’s not as unobstructed as the marketing folks want you to believe. 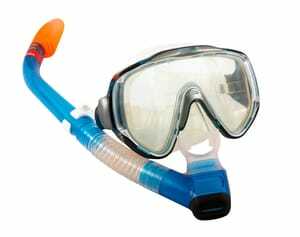 Standard goggles for diving and snorkeling require that you have a snorkel in your mouth. The mouthpiece can be uncomfortable after even a short time of having it in and that can quickly ruin the fun. 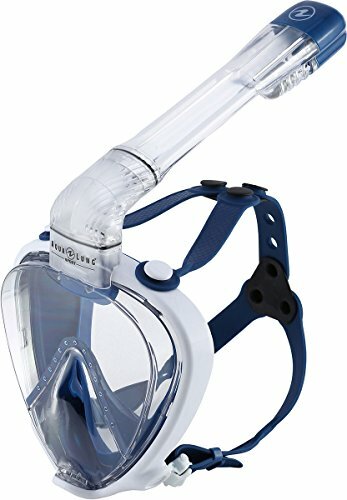 If you in the past have not found a comfortable mouthpiece in a snorkel, then using such full-face goggles will be a godsend. Another great advantage of these kinds of masks comes into play if you have a mustache. 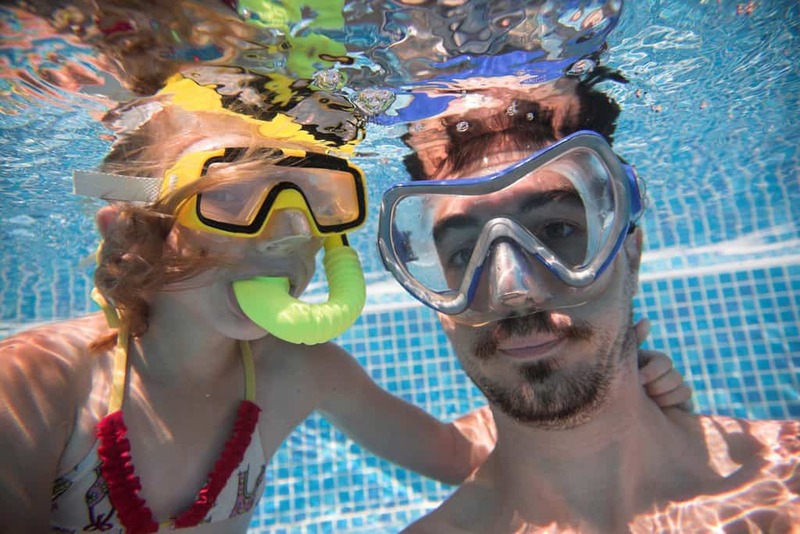 Regular snorkel and scuba masks do not create a waterproof seal with your skin as the hair of your mustache disrupts it. 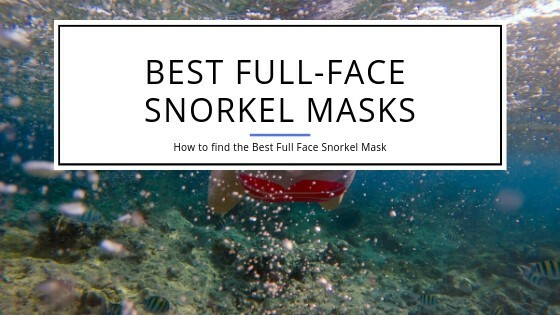 A full-face snorkeling mask is different as it covers your whole face. Your mustache won’t be in the way and that makes these goggles the best ones you can get. If you have a beard, then you will unfortunately not be as happy with these masks as with a mustache. The reason is that your beard will disrupt the seal and there most likely will be water coming into the mask. 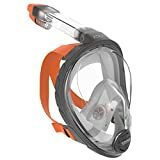 Looking over all these initial concerns, what do you have to know to find the best full face snorkel mask? Check out the rest of the post to find out! We evaluated and reviewed the five top contenders for you. Have a look at the masks below if you are looking to buy one. We picked five of the best and most sought-after masks for you. They make these masks from the highest quality materials and will keep you safe during any snorkeling trip you take. Is one of them the best you can get? Check it out! Wildhorn Outfitters debuted the completely redesigned V2 of the Seaview 180 Degree in 2019. It’s a revolutionary new design that tremendously improves on the advantages of traditional full-face snorkel masks. At first glance it looks quite different from any other full-face mask. Quite futuristic and probably somewhat more like a helmet when you look at it from the front. Yet, when you look deeper you realize that all the changes that have been made, are made for a good reason. This mask truly pushes the limits and leaves all other masks in the rearview mirror so to speak. You get 180 degree views, easy and comfortable breathing, fog-free viewing and an optimized action camera location and mount. Let’s start from the beginning though. The snorkel is not positioned on the top of the goggles but to the side. It also is shaped to provide an optimized angle of the intake when you have your head in the water. The result is what Wildhorn Outfitters calls the ‘FLOWTECH Advanced Breathing System’. It’s a system that makes breathing even more natural and safe. CO2 is exhaled safely and with no risk to your health. Not only that though. In rougher waters the snorkel keeps water out and you can still breathe without a problem. Having the snorkel connect to the bottom of the mask also provides improved airflow inside the mask. Humid air is kept away from the lens improving the already excellent fog resistance of these masks. You breathe inside a separate breathing chamber through your mouth or nose as if you were walking down the street. The camera mounts to the side of the mask and no longer to the top. The tremendous advantage is that the camera stays underwater all the time. With the old design you more often than not were filming the scenery above the water instead of underwater. The skirt is made from soft silicone that produces a tight fit with your face. It’s comfortable to wear for hours and with breathing being so easy you can literally go snorkeling for the day! Should for any reason water get into the mask then you can drain it by simply lifting your head out of the water. The drain valve at the bottom takes care of the water and you’re in the water instantly again. The new design does not overcome the issues we’ve remarked on in the past with these kind of masks. They trap a lot of air which makes it hard to dive down. The snorkel is designed to keep water out but if you try to dive straight down then the mechanism can’t close. Water will get into the mask. That’s true for every dry-top snorkel and is not a specific issue of the Wildhorn Outfitters Seaview 180 Degree V2. You can purchase the mask in a variety of colors and sizes. The three available sizes should fit nearly every size of face from children to adults without a problem. 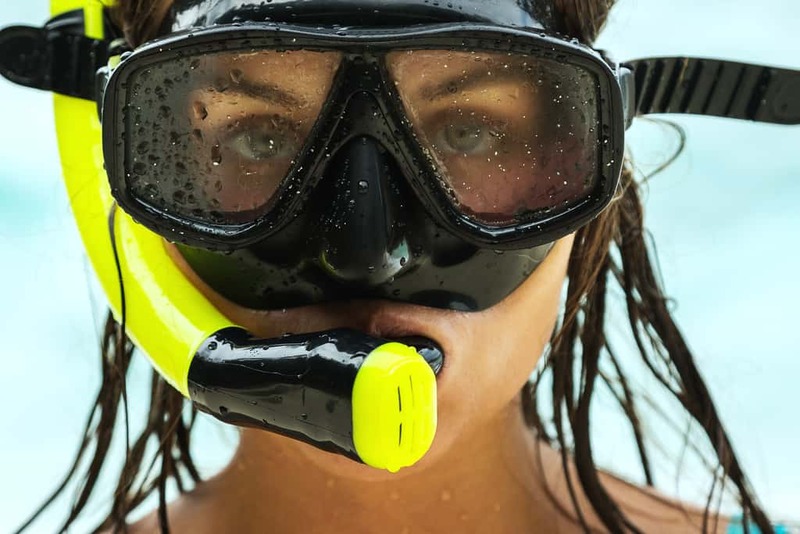 The Tribord Easybreath is the original full face snorkel mask. And today it’s still every bit as good as it was the first day it came out. 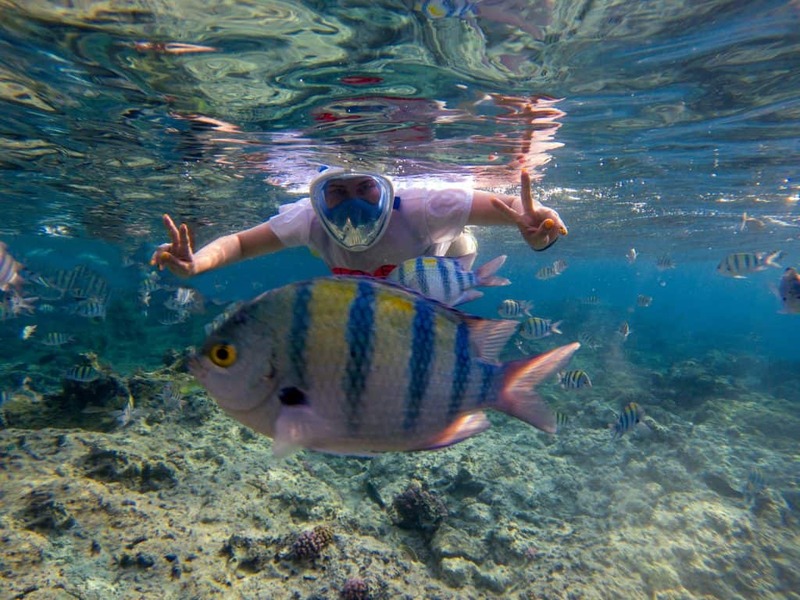 It provides and exceptionally big field of view that lets you enjoy all the sights and sea life while you snorkel. The full-face mask allows you to breathe with your mouth or nose. The days of having to force the snorkel into your mouth and biting down on it are gone. This makes for a much more comfortable snorkel experience that is less tiring. Tribord patented the breathing system and it is quite the clever design. There is a relief valve at the bottom that allows to clear out any trapped water inside with ease. It’s an ingenious mechanism and helpful when snorkeling. The snorkel itself has a one-way valve which closes the snorkel when it gets immersed in water. This prevents water from coming down the snorkel that end up in your mouth and more often than not gets you to gag. A nice feature is also that the top of the snorkel is kept in bright orange which makes it easy to see by others while you snorkel. This is a great safety feature which helps to prevent collisions while you snorkel! The window is large and clear. It’s made of a shatter proof polycarbonate which makes the mask a very durable piece of gear. Compared to many cheaper masks you will save money by not having to replace the mask that often due to broken windows, etc. The Easybreath is not your mask if you require wearing glasses while snorkeling. None of the full-face masks will be good for that as you cannot get prescription lenses for the window. Your fit might also not be perfect if you have a full beard. Otherwise, you can trust to get a tight fit through the silicone skirt of the mask against your face and the straps to adjust the mask. The Tribord Easybreath is a rather large mask. The trapped air inside will make it nearly impossible to use it for free diving or any other diving as it causes too much buoyancy. That should not be a problem considering it is a snorkel mask and not a dive mask. The mask comes in various sizes and colors. The sizing should allow to find a perfect fitting mask for any shape of head, even for children. There are four sizes available which is outstanding! You can get the mask in three different colors: Atoll, Blue and Pink. The top of the snorkel is always kept a bright orange to make it easy to see in the water. Where can you find more information about the Subea Easybreath? These are just some highlights of the Easybreath goggles. But, that’s not all. You can find the detailed review of this mask here to get a more in-depth insight into what makes this mask one of the best around. The Tribord Easybreath is overall a great mask. In the past it kind of lost the comparison with the Seaview 180 Degree full face snorkel mask because it didn’t offer a GoPro camera mount. This has been remedied and you can purchase an optional mount for your GoPro camera when you own the Subea/Triboard Easybreath mask. Overall though, both masks are pretty much similar. The Tribord has a slight advantage as it’s impossible to fog the mask up. The Seaview mask can fog up a little when breathing heavy but it easily clears when going back to a shallower breathing. On the safety side the Easybreath also has a tiny advantage through the bright orange end piece of the snorkel. It is easier to see in the water and at least in theory can help to prevent collisions. Besides those small differences both masks are on par. They even look very similar when you hold them next to each other. You can’t go wrong with either! There are a few more differences to know about and consider in your buying choice. You can check them out in our head-to-head comparison of these two snorkel goggles. After comparing the Tribord mask with the Wildhorn contender to find the best of the two, we also compared the Easybreath with the Ocean Reef Aria. You can have a closer look at this comparison here. To provide you with the best knowledge on which mask to pick, we also have created a comparison between the Subea mask and the Ninja H2O which you can look at here. 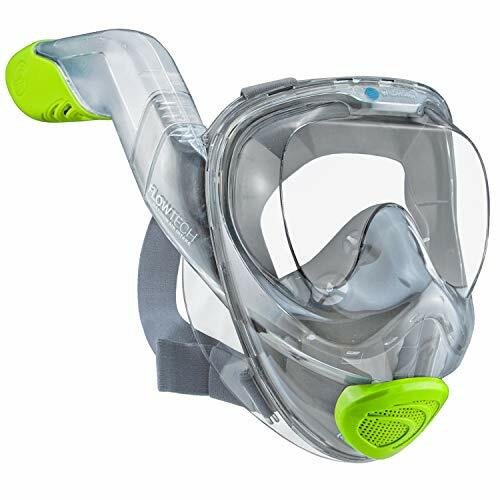 The Ocean Reef Aria full-face snorkel mask is very similar to the Tribord. It’s overall a very solid mask made from some of the best material around. It is a high-quality mask, fits great and works as advertised. One downside we see is that it is more expensive compared to the other snorkel goggles shown in this list. For most people it won’t make sense to get the Ocean Reef Aria vs. the Easybreath. Yet, there are exceptions. If you wear glasses, then the Aria is one of the few masks that has optional corrective lens adapters. These adapters allow to have prescription lenses installed that you then wear while snorkeling. These frames fit tight inside the skirt which leads us to believe it might not work great for everybody. There’s nothing not to like about this mask. It comes in a few color combinations that might make you scratch your head though. Ever thought of orange and pink? In one mask? You might want or need this mask if you want color combos like that. It might even be worth to pay more than you’d pay for the original. One thing to consider is also that technically this mask comes in a large variety of sizes. Four to be precise. Including an XS sized mask for children. However, specific color combinations will only be found for certain sizes. This is an overall good full-face mask. It’s a high-quality product that will last you a long time. The price in our opinion is too high. And you have to pay money if you want to add the GoPro camera mount. You’re better and cheaper off to look at the Seaview 180 Degree. Find out more about the Ocean Reef Aria! The Aria is one of the top snorkel goggles you can find. If you want to find out more about this mask, then check out our in-depth review that will provide you with a lot more detail. As already mentioned above, we also have a comparison between the Aria and the Subea Easybreath. You’ll be able to figure out for yourself which of these two masks might be best for you. One of the newer models on the market is the Head/Mares Sea Vu. You will find the goggles marketed under the Head brand and other times under the Mares brand. The reason being that Head owns Mares and depending on which market you look at you might find one or the other or both. In short, this is a great mask. It comes in several sizes and color mixes. You can pick from four different sizes and get it in five different colors. Not all color schemes are available in all sizes so you might have to compromise a little. The mask has a flat lens and sits comfortably on your face. The design provides excellent visibility in all directions through its rather large lens. The lens is made from shatterproof polycarbonate and offers crystal clear views of the world underwater. Head/Mares designed it to prevent any kind of fogging and successfully does that. There is a purge valve at the bottom that lets you easily clear any water that might have gotten into the mask. The air you breathe in and the air you exhale travel to and from the snorkel in different routes. 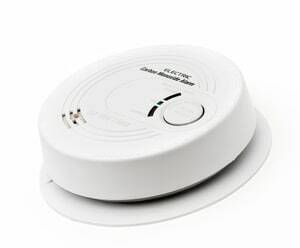 This provides excellent fog prevention and reduces the chance of CO2 build-up. The snorkel is designed as a dry snorkel. Under normal circumstances you will not have any water enter through. Even if you submerge for a moment to explore the underwater world further, you will stay dry inside the mask. The tip of the snorkel has a brightly colored part to ensure that others will see you while you snorkel and not run over you by accident. For easier transportation you can also remove the tube. This mask does not offer a mount for an action camera. If you are into making movies of your snorkel trips, then look at goggles that have a mount. 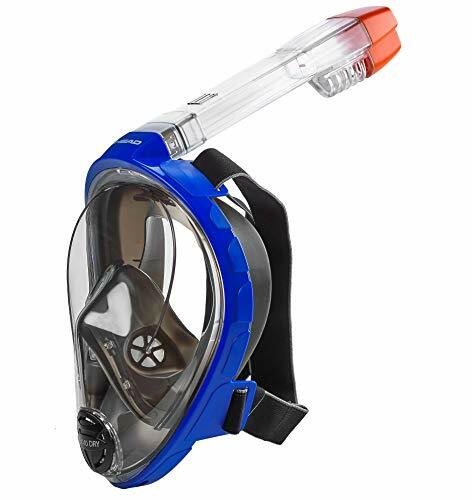 Aqua Lung entered the market of full face snorkel masks with the Smart Snorkel model. As you would expect from a renowned scuba and snorkel gear manufacturer, you will get a top-quality product if you go for these goggles. Looking at the mask you realize that it has a slightly different design approach compared to other full-face snorkeling masks. The lens is flat compared to others. This provides good visibility straight out at the cost of somewhat reduced visibility on the edges of your optical spectrum. That’s not a problem at all and we appreciate the excellent visibility you can get through this design choice. The lens is made from shatterproof polycarbonate that keeps your face and eyes safe from the outside world. It is available in three different sizes. This allows pretty much any size and shape of face to find a match that seals tight. If you are a fan of different colors, you will unfortunately not be too happy. There’s only one color that the mask is available in. Another design aspect that Aqualung considered is to have a low breathing resistance. You practically breathe as easily as if you are on land with this mask. That also results in being fog proof all around. The goggles have a dry top snorkel that prevents water from coming into the mask. This is only true when you dive down a little at a shallow angle. If you dive straight down the dry top cannot close the snorkel and water can come into the mask. The skirt and straps are made from hypoallergenic silicone. It’s very similar to the top-quality materials that Aqua Lung uses in their scuba diving gear. There are a lot more snorkel goggles available. Most of them are to be honest, cheap knock-offs of the masks we list above. On the plus side, most of those other masks are cheap. On the downside, they are unfortunately made from cheap material and do not last long. Another issue you can run into with these cheap models is that the lens is not made from shatterproof polycarbonate. This does not seem to be that big of an issue in the first place as you won’t dive deep and there won’t be a lot of pressure against the mask. But, think of what happens if by some freak incident the lens breaks. If it is shatterproof polycarbonate then you’ll have a crack and in the worst case you replace the mask. With cheap plastics you might have sharp fragments hitting your face and eyes. The worst case in that is serious health risks and injuries that nobody would want to have. Cheap material is not only a potential threat to your health but can also result in a much shorter lifetime of your goggles. Most people like to snorkel in warm water which usually also means you are in sunlight a lot. 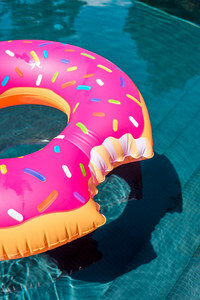 Inferior materials, specifically plastics, will age in sunlight as they are not capable to withstand the UV rays. That will fairly quickly make them prone to breaking and leaking and you will then have to replace that mask a lot quicker than having gone for a quality product. In the worst case some of these masks can be dangerous when you snorkel for a long time. If they do not transport your exhaled breath effectively out of the mask, then you run the (low) risk of having too much carbon-dioxide you breathe in. All the masks listed above are designed to transport CO2 out of the mask effectively and efficiently. You won’t risk breathing in too much of it. The danger in using such a cheap mask is that there is CO2 build-up inside the mask and you eventually breathe in too much of it. This can have serious health implications and in the worst case even lead to death. Some of these cheap full face masks also have a soft area over your nose that allows you to equalize in case you dive straight down. In theory, that’s a nice feature. However, these goggles all trap a lot of air which makes it hard to dive. Also, diving straight down will render each of these dry top snorkels useless. They won’t close and prevent water from coming in so you potentially end up with a flooded mask after trying to dive straight down. This also brings us to one downside of all of these full-face snorkel goggles. You can’t purge them the way you can with traditional designed ones. A traditional mask can easily be purged by lifting it slightly and blowing into it with your nose. The contenders we are looking at here allow you to breathe through your mouth or nose. This makes it impossible to purge by blowing out through your nose. This is not a problem of one specific set of goggles, it’s one that comes with the ability to breathe through your nose and mouth. You should always remember that these masks are made for relaxed snorkeling and not for exhausting free diving or swimming. Such physically more straining activities will increase your rate of breathing and potentially can increase the CO2 in your mask! 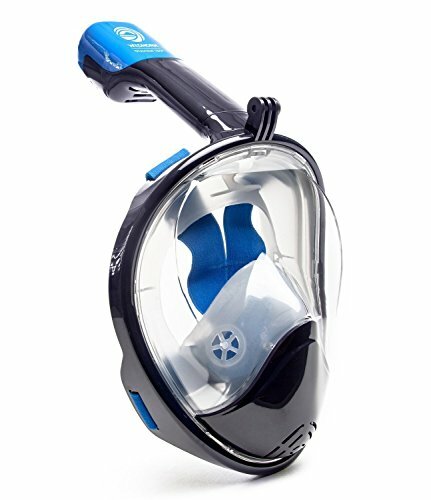 What do you have to consider to find the best full face snorkel mask? Check out the buyer’s guide below! When you’re in the market for a new full-face snorkel mask and you only look at the pictures, then you quickly will realize that they look all pretty much the same. If you compare that, for example, to looking at the different best dive masks then you at least can see a difference between those. Full-face snorkel masks all are derived from one original design. And that was the Tribord Easybreath. The major updates and innovations you can get are improvements and changes on the breathing chamber and mounts for action cameras. You can find these on the Seaview 180 Degree mask. Important factors to keep in mind also are to have a snorkel that stays dry and a valve to get rid of water inside the mask. Regarding safety you need to make sure that the window is of high-grade, impact resistant polycarbonate. Another good feature to have is a snorkel end piece is in a strong signal color. This allows others to see you easily and avoid collisions. 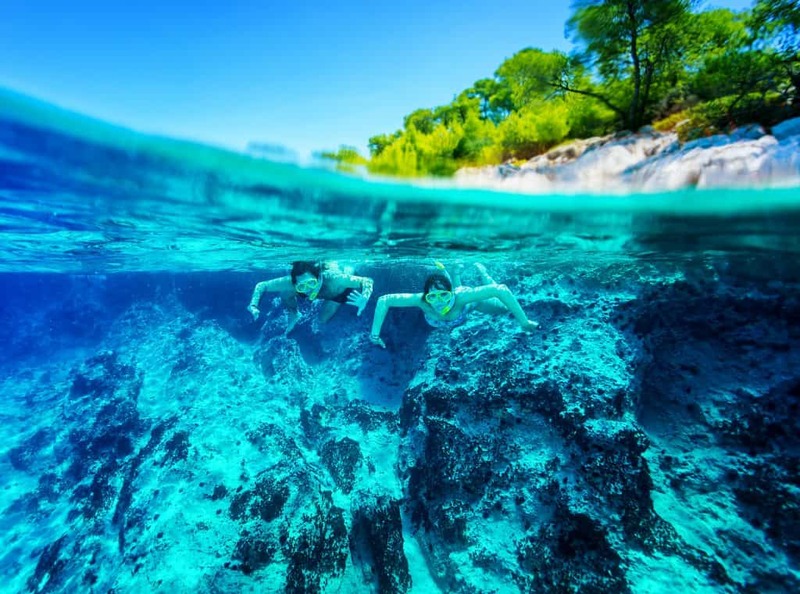 Snorkeling is a family-friendly activity. It’s relaxing and there’s so much to see underwater. You also do not need any skills whatsoever once you know how to swim. It is important to use the right equipment to make it a pleasant recreational activity for you and your family. Until a few years ago the best snorkel masks you could get where the same as the ones you used for diving. Technically, there was and is nothing wrong with that. You added a snorkel, and you were good to go. And that’s where the problem started for most. The snorkels had a mouthpiece you needed to bite down to keep it in place. Even if it’s your own, that’s a rather unhygienic piece of equipment. The more important issue though is or was that you had to breathe through your mouth. The old goggles and snorkel combinations did not allow for any nose breathing. Many people didn’t like this leisure activity because of that as their instinct was to breathe through their nose. Another problem with the old snorkel tubes was that they didn’t keep water out when they got submerged. There’s a lot of drinks that taste better than a nice swallow of salt water. Many people tried the activity and quickly stopped once they drank a mouthful of salt water and gagged under water. Not only does it taste gross, it also can lead to panic attacks for some people as they immediately fear they drown. Newer generations are dry so they don’t allow water to get into the snorkel and your mouth when submerged. The full-face masks completely took away with those old types of snorkels and breathing problems. As they cover the whole face, they allow to breathe through your mouth or your nose. Just as if you’d take a stroll in a park. They also are designed to be dry snorkels and will keep the water out of the snorkel and the mask if they get submerged. Dry top snorkels work well if you dive slowly and in parallel to the surface. If you try to dive straight down the mechanism that keeps the water out of the snorkel won’t work. It will not close and you end up with water in your mask. Once you have water inside your mask, you will find another problem of these goggles. You can’t easily purge them while you have your head underwater. You have to come up to activate the purging mechanism. There’s no way you can purge them by blowing into the mask through your nose as you can do with a standard dive mask. Another advantage of a full-face mask is that it is overall more comfortable to wear. As it covers your whole face, the skirt is pressing all around your face. Traditional masks can have pressure points in the middle of your face which might make that more uncomfortable to wear. This is true especially when you snorkel for a longer time and also if you use a cheaper dive mask. Many people, for whatever reason, think the cheapest dive mask is good enough for snorkeling as they won’t dive. Technically, that might be true but these cheap dive masks also don’t use the best components and materials and thus are often leaky and/or uncomfortable to wear. A full-face mask, if it’s not one of the cheap knock-offs, will usually use high-quality components and materials which make it very comfortable to wear for long times. Another advantage of the full-face snorkel mask over the traditional dive mask/snorkel combo is that you can’t forget the snorkel at home. You won’t believe how many people go snorkeling only to find out they brought their dive mask but forgot their snorkel at home. They had to clean it and took it out and forgot to put it back. Just one of those things we all tend to do. A full-face mask has the snorkel built-in. If you remember to grab your mask for snorkeling, you also will have your snorkel with you. This might not be an obvious advantage but experience shows it is one to think about! Traditional masks restrict your view to where you have a good sight on what is in front of you but not much besides that. Full face masks will not give you a full field of view but one that is much larger in comparison. You won’t get a full 180 degree view in all directions. With some better masks it is close to the 180 degrees though. Around the edges you will see the frame of the mask and in some other areas you will get a pretty distorted view due to the curving of the lens. That is not to say that it is a tremendously better field of view compared to a traditional mask. You’ll see a lot more underwater than you would otherwise so it’s worth getting one of these masks. Another benefit of having a larger field of view is that you can see your snorkel buddies easily. That’s specifically important if you snorkel with your children and need to keep an eye on them. None of the lenses of these full-face goggles is made from tempered glass. They all are made from polycarbonate or lesser quality plastics. The high-quality masks use polycarbonate lenses that are shatterproof. That means that if the lens breaks it will not disintegrate into sharp pieces but instead will stay in one piece. Lenses from polycarbonate are scratch resistant. Do not expect them to be as strong as tempered glass. They can scratch and if you are not careful, then they will scratch. Having high-quality lens materials is important to get the most lifetime out of your mask while having a crystal clear view in the water. It also helps with traveling as you don’t have to worry that the lens will scratch or break from the smallest pressure. Most lenses nowadays have a flat front. That means that you get clear views straight out and distorted views on the edges where there are sharp curves. Cheaper masks and older models have round lenses. These distort the view (slightly) when looking in any direction. Compared to a flat lens the curved variant has a consistent distortion that is minimal across your whole field of view. 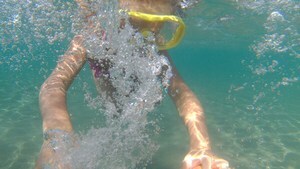 Most snorkelers prefer the flat lens even though there is a greater level of distortion around the edges of the lens. Last but not least, these kinds of masks are usually also more fog proof than traditional dive masks. As the air continuously exchanges inside the whole mask through you breathing in and out, the humidity level also stays more regulated. This reduces the chance of your mask fogging. In a traditional mask, you have the air sealed around your eyes and nose and it’s not exchanged at all during your snorkel adventure. This increases the chances of the window fogging up and you having issues seeing the beauty of the sea underneath you. 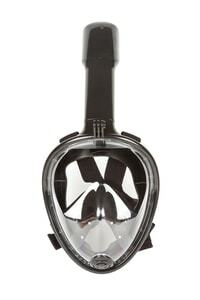 Some full-face snorkel masks also have a mount for an action camera included. 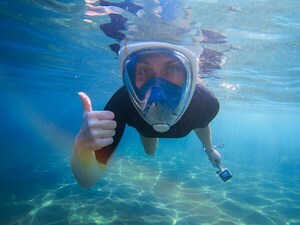 Most allow to add a GoPro camera on top of the mask so you can tape the same scenery as you see it while you snorkel. This is a great feature as it allows you to continue to use your hands while filming. If you have the camera in your hand, then one of your hands is constantly in use holding the camera. However, while it is great to have the camera attached to your mask, it also has downsides. 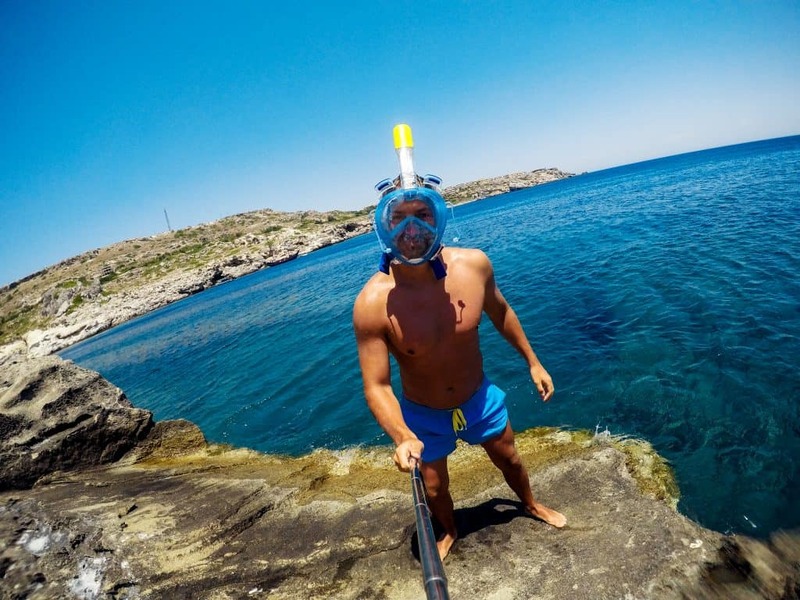 Most masks have the action camera attachment on the top or on the snorkel. The problem there is that if you don’t have your face underwater, your camera might not be inside the water but above. At that moment you will film nothing but the surface of the lake or ocean. 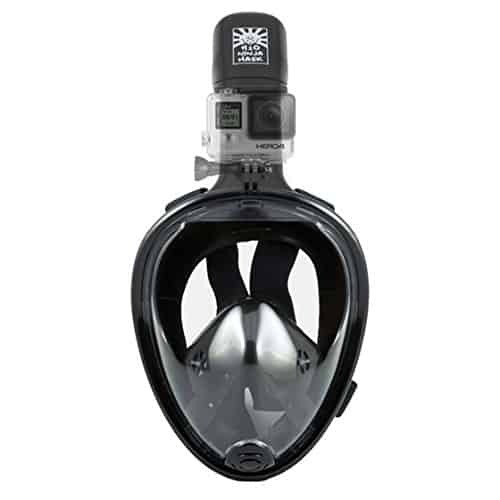 Masks that have an integrated GoPro attachment that sits in the frame on the top or bottom of the mask. These will usually ensure that the camera is inside the water to film what you see. 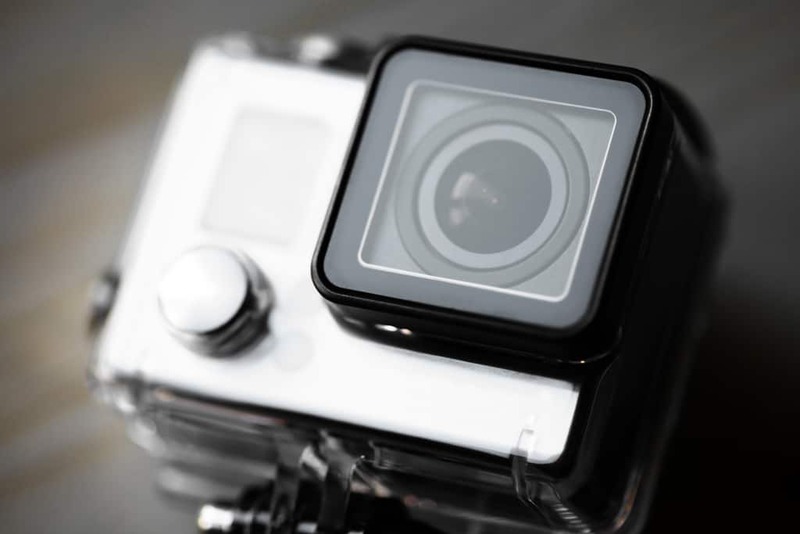 One simple way to improve the location of the camera is by getting a GoPro extension that lets you change the position of the camera and push it forward and deeper into the water. Full-face masks have not only advantages though. There’s one disadvantage, and that comes from the large volume of these masks. If you snorkel and see something interesting a few feet below you, it’s much harder to dive down with a full-face mask compared to a traditional scuba mask. Why, you ask? The air trapped inside the mask creates a lift under water. This makes it much harder to dive down as the air wants to keep you afloat. 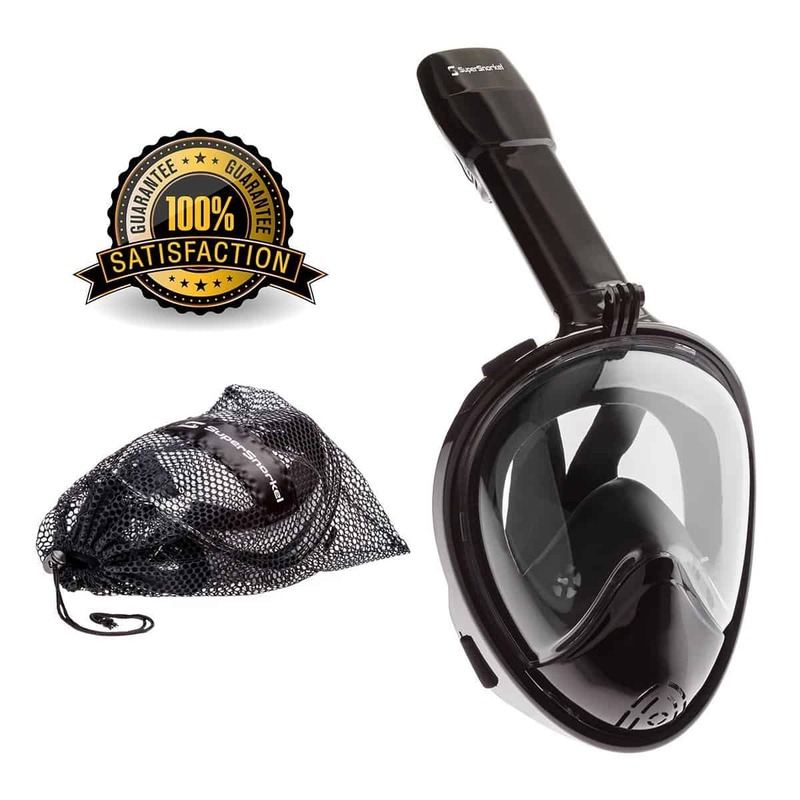 Modern traditional scuba masks are designed to minimize the amount of trapped air to make it easier to dive. 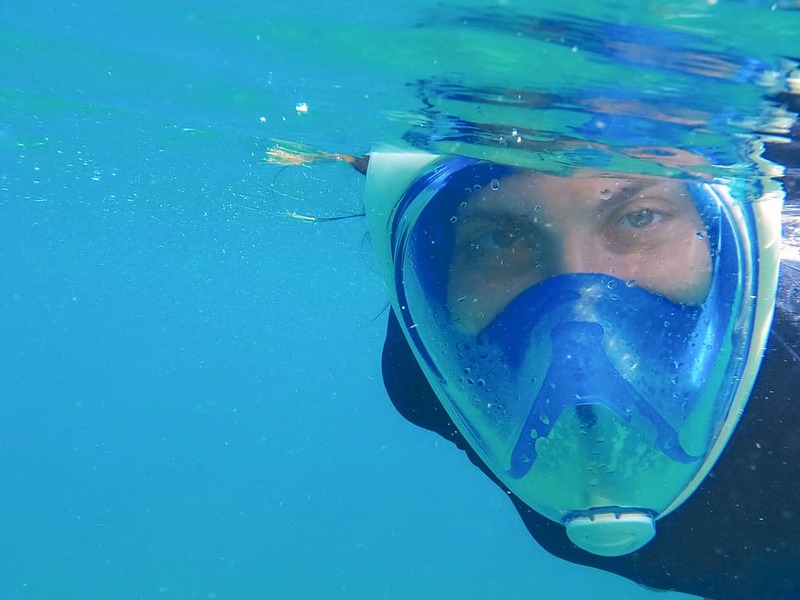 The full-face mask traps a lot of air which helps you stay afloat and makes it easier to snorkel but it also makes it nearly impossible to dive with them. It feels like there are new full face snorkels coming out every day. Pricing for these ranges from cheap to expensive to overpriced. Masks that are cheaply designed can also put your health at risk. If the mask is not designed to optimally remove your exhaled breath, then you risk having CO2 build up inside the mask which can lead to health risks. In most cases, you get what you pay for. Masks that are really cheap will usually be made from cheap material and won’t last long. Some expensive masks are also not worth the money. The masks we listed above are all reasonably priced and offer top-quality. They are worth the money and will last you a long time. Does your face stay dry? If the mask fits correctly, then your face will stay dry which makes it very relaxing and comfortable to snorkel with such a mask. A traditional mask will only keep the area it covers dry while the rest of your face gets wet. Having the mask cover your whole face is not always a good thing. It actually can get hot inside the mask if you snorkel for a long time in hot environments. A traditional mask would allow water on your face which would help to cool you down. The large mask covers your face and your breath will heat it up even more. That’s no danger but it can be uncomfortable after a while. Can You Wear Prescription Glasses? The short answer is no, you can’t. The problem is that the temples of the frame will disrupt the seal between the skirt of the mask and your skin. This will allow water to come into the mask. One of the best and easiest alternatives is to wear contacts. Your face and eyes will usually stay dry inside the mask so there’s no danger of having the contacts washed out of your eyes. However, not everybody feels comfortable wearing contacts. 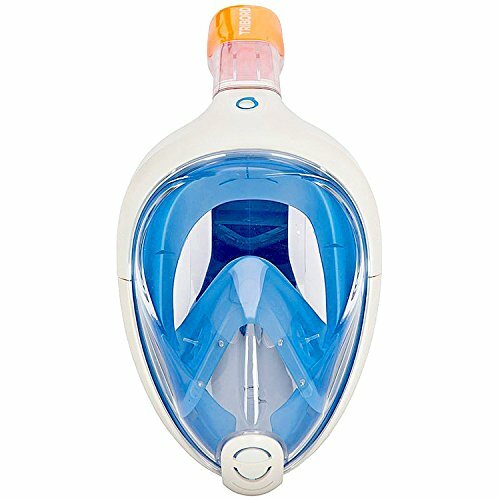 The Ocean Reef Aria mask has a prescription lens accessory you can put into your mask. Your optician has to fit the classes into the frames and you can then place those into the inside of the mask. This works ok but as there’s not a lot of room inside the mask it can be uncomfortable for people. Is there any resistance when breathing through your nose or mouth? These kinds of masks have increased the comfort regarding breathing compared to old-fashioned snorkels with a mouthpiece. Will you truly breathe like on land? No, you won’t. You have a limited amount of air you can get through the snorkel. However, the amount of air you can breathe in and exhale is close to what an average person would get on land. Is breathing harder than on land? Yes, it is a little harder but nothing to be worried about. After using the mask for a few minutes you won’t even feel it anymore. Is it easy to travel with these masks? Unfortunately, it’s not that easy to travel with them. They are bulky and need a significant amount of space in your suitcase. Even the newer models which allow to remove the snorkel are still quite large. A traditional mask and snorkel pack a lot smaller and you might consider that if you travel a lot or want to travel light. If the mask has a removable snorkel, then the first step is to secure the snorkel onto the frame. Make sure it sits tight so there’s no chance of water coming in through it. Next you need to brush your hair out of your face. Pull it back and make sure that there’s no hair dangling in the areas of your face where the skirt will hit your skin. Put the mask on your face. Keep the straps in front for now. Make sure that the mask sits tight on your face. Pull the straps over your head and adjust them until the mask sits comfortable yet tight. Breathe in and out and make sure you get air. Make sure the skirt sits tight around your face and isn’t squeezed anywhere. Now you’re ready to put your head into the water. Enjoy your snorkeling views! Can you wear it with a beard? There’s no good way to wear such a mask if you have a beard. Most likely the beard will interfere with the skirt and you will experience leaks. It’s a different story if you have a mustache. The mask will completely cover it so you won’t have a problem and will not experience any leaking. Can you talk while wearing it? Surprisingly, you can’t really. You would think with not having a mouthpiece you should be able to speak and also be heard by your partner. However, that’s not the case. The mask blocks nearly every sound you make so you won’t have an easy time talking to anybody. Can you clear it like a regular mask? You can’t. The design lets you breathe through your mouth or nose and you cannot create pressure inside the mask to clear it. The air you exhale will go out through the snorkel. You can clear a traditional mask by leaning back and exhaling through your nose. This will force the water out of the mask. It does not work like that with full face designs. You will have to get your head out of the water which will then allow the purge valve to open and let the water drain. Overall, it’s not a big concern but if you are used to a traditional mask and the way to clear it, you will have to get used to not being able to do that. What else do you have to consider? One major issue is that these masks are a lot more comfortable compared to traditional setups. This does often result in snorkelers being out in the water for long periods of time. 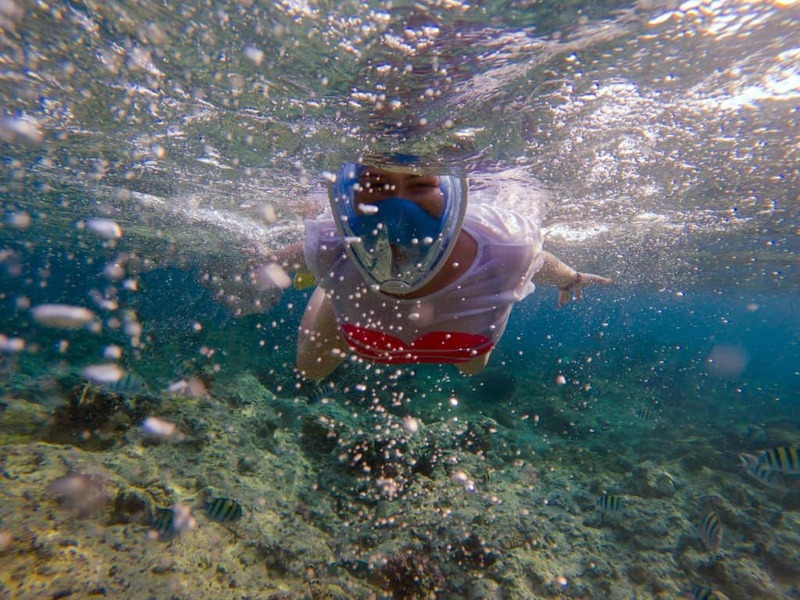 Snorkeling is most fun if you do it in warm water like the Caribbean. Extended times out in the water will cause a lot of sun exposure. If you are not careful, you will find yourself having terrible burns on your back. It’s just easy to forget how comfortable snorkeling has become when you can breathe naturally! Always put lots of sunscreen on your back and the back of your legs! It might be better and safer to wear a good rash guard with UV protection! Can you wear them to swim laps? These masks are not designed to be used to swim laps. That doesn’t mean that you can’t but they won’t be of any help if you try to break any records in the pool. In the best case they give you better visibility but you will most likely experience more drag when swimming. It’s not designed to help you swim faster or improve your swimming overall. To be honest, the Seaview 180 or the Tribord Easybreath are the overall best masks you can find today. They offer the best performance and quality for the price and will last you for many years to come. All the masks above are in the same price range. If you are on a budget, then look to find one of last years’ models and you’ll end up happy. 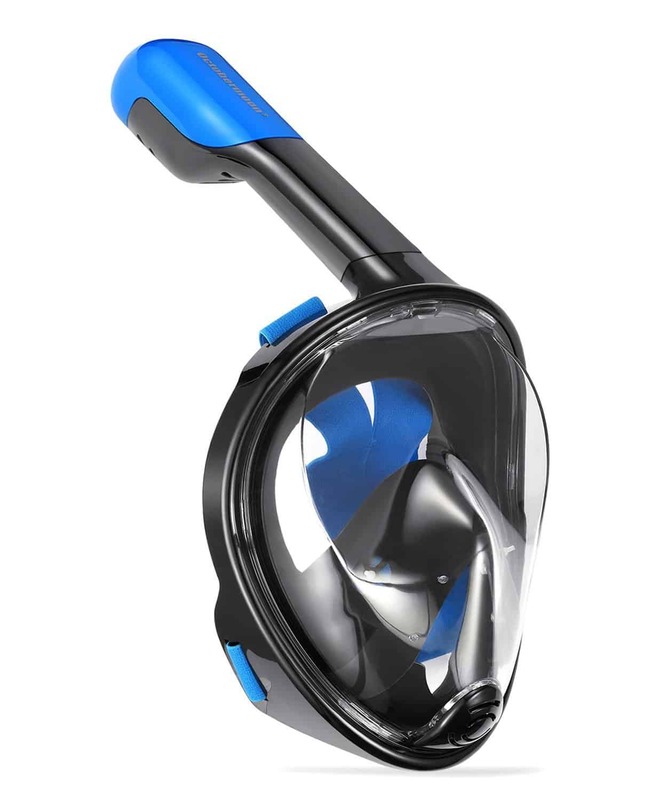 Wildhorn introduced a Version 2 of the Seaview 180 which is a completely different approach to full-face snorkling masks. This triggered the update of this list of goggles and we replaced the original/old Seaview 180 with the new one which you see in the section above. For reference, here’s our take on the old mask that you still can find and which is still a great buy! The Seaview 180 degree snorkel mask by Wildhorn Outfitters is a staple for full face masks since it came out several years ago. Until this day it is one of the best, if not the best, 180 Degree full face snorkel mask available. It provides a full 180-degree view which lets you enjoy the underwater wildlife and scenic beauty. You can breathe through your mouth or nose with this mask while having a surround view through the wide-angle lens. The mask comes in two sizes and roughly fits kids 7 years or older if they wear the smaller size. The Dry Snorkel Technology prevents water from coming through the snorkel into your mouth. No more swallowing salt water and gagging on it. 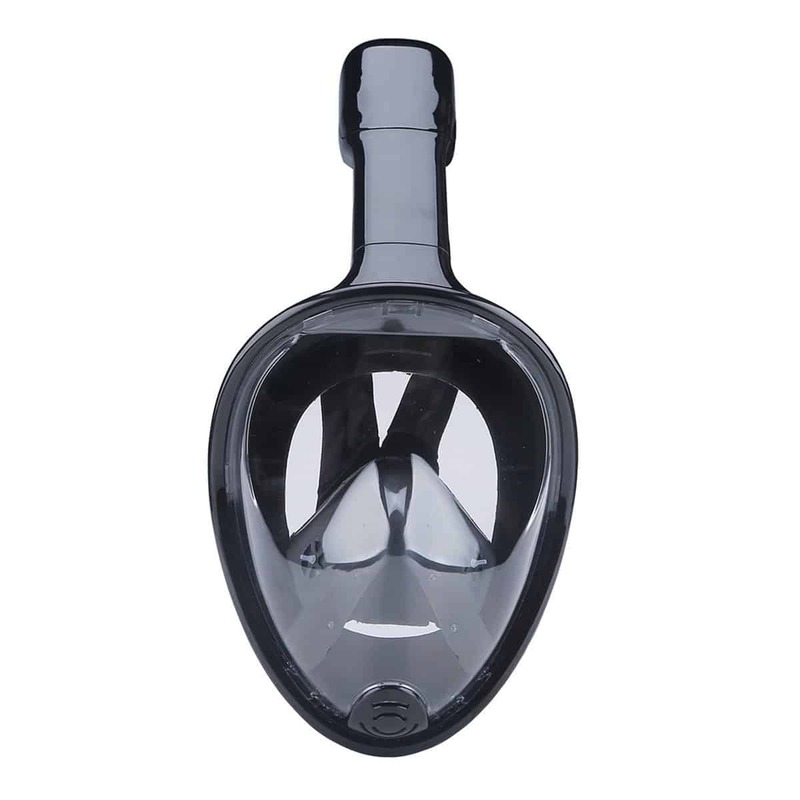 The overall design of the mask is also a lot more comfortable than traditional snorkels as you do not have to bite down on a mouthpiece! They make the mask skirt from silicone which provides a comfortable and snug fit to your face. The wide straps allow easy adjustment and won’t get tangled in your hair. The mask does not provide the ability to wear glasses as the tight fit would be disturbed by the arms of the glasses. There is also no option to replace the lens with prescription lenses! Also, if you have a beard, you might not get a snug fit with this mask or any other snorkel or dive mask. You shouldn’t have a problem with a mustache though. The separate breathing chamber is an innovative design. It forces the airflow away from the lens. This pretty much eliminates any fogging on the lens. You can enjoy the view a lot better than with many other masks. Due to the design of this being a full-face mask, there is a lot of air between the lens and your face. This will provide quite a lot of buoyancy so you will have a harder time diving with this mask. As they designed the Seaview 180-degree mask for snorkeling and not for diving, this is not really an issue at all. The Seaview 180-Degree full face snorkel mask also has the added feature of a GoPro camera mount. 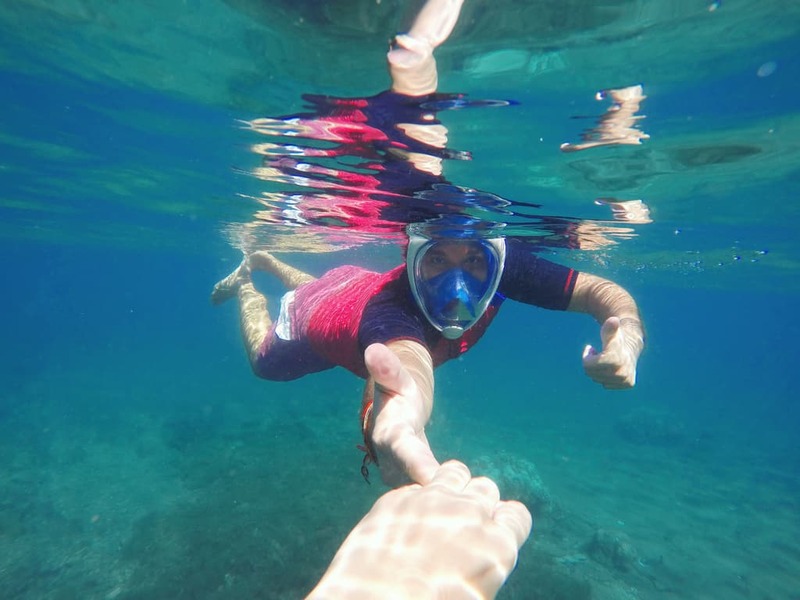 It’s your perfect companion if you want to make a video of your snorkeling experience as you need not hold the camera in your hands. The mask comes in a range of colors. You can get it in Navy Blue/Gray, Plum/Gray, White/Blue, White/Pink and White/Teal. It comes in two different sizes to fit children and adults perfectly. What else should you know about the Seaview 180? The Seaview 180 is definitely one of the best snorkel goggles you can buy. If you want to find out how it fares against the Tribord Easybreath, then have a look here. There’s also more to say than what we can pack into this overview of the Wildhorn mask. If you want to know all the nitty-gritty then check out our in-depth review of this outstanding mask. We removed several of the masks we had in the original article as they are not up-to-date anymore or because they are no longer sold. For reference we provide you with the information on those masks below. Know that they are no longer available or no longer recommended. The Octobermoon full face mask is definitely the ‘best of the rest’. It’s a similar design as the Triboard Easybreath yet it is cheaper in price. One could also call it a cheaper knock-off of the Tribord mask. While there is truth to it, it’s also not fair to reduce the mask that way. It’s a quality snorkel mask that is actually high quality. The snorkel is a model that will automatically close when it submerges. The mechanics of this are quite sophisticated as the valve closes the snorkel instantly when you dive. It also is not one of those cheap mechanisms that sometimes doesn’t work but a really well-designed piece of gear. The snorkel is not in a highly visible color like on the Easybreath. This is not a problem but a highly visible color can help others to see you and to avoid collisions. The skirt of the mask is made from high grade silicone and it shows when you put the mask on. It fits tight while still being comfortable. It’s so well designed that you possibly even get a tight seal if you have a beard! Even with this great skirt you won’t be able to wear glasses while using this mask. You won’t be able to get a tight fit around the arms of your glasses. There’s also no possibility to change the lens with a prescription lens. The volume of the mask will make it hard to dive. The trapped air produces too much buoyancy and that will force your head to stay afloat. A full-face mask will not be a good choice if you need a mask for both snorkeling and diving. The Octobermoon snorkel mask comes in two different sizes. The smaller version is intended for children and people with smaller-sized heads. The larger size works for medium to large heads. You also have the choice between two color combinations. You can either get it in black or in blue. If you’re looking for a great budget priced mask, then you don’t have to look any further. You get a great mask for a lower price than the Seaview or Easybreath masks. The UooCool mask is one of the latest new masks in the full-face snorkel mask market. And they have designed a solid and high quality full face snorkel mask. The snorkel is designed to stay dry under water and the design works well. It stays dry under water. The mask has a water purge valve at the bottom of the mask to get any water in the mask out easily. The mask seals well even when you’re not freshly shaved. It provides a comfortable fit with a good skirt. The straps allow to adjust the fit perfect. The mask has no attachment for a GoPro camera which seems surprising for a rather new model on the market. The overall design is solid and the field of view is large. The snorkel top is colored to match the mask. It’s not a bright signal color so it might not be easily visible like for example the Easybreath mask. The mask comes in two different sizes to fit nearly any size and shape of face. The mask comes in several colors which include black, blue, green and two different pink masks. It is overall a well-designed mask for a good price. The Ninja mask is a good and high quality mask. It comes in two editions. The standard version and the GoPro version. We could write a lot about this mask as it seriously is a good mask. However, the price in our opinion is simply not justified. The Ninja is not better than the Seaview or the Easybreath yet it costs nearly double the price. There’s no reason to spend that much money in our opinion so for a mask is not in any way better than others we already looked at above. However, if you have too much money to spend, then you can be sure to get a great mask for the money you spend. The name is a mouthful but thankfully the snorkel is not. Being a full face mask means that there’s no snorkel piece to bite onto. You can breathe through your mouth or nose as if you are on land. This mask is a relatively new contender on the market and their claim to fame is that they have the longest snorkel of all full-face masks. We have not measured it against all the available snorkels but yes; it is a long snorkel. This gives you a little more leeway when moving around before accidentally submerging the snorkel. The mask has a soft skirt that provides a tight and leak free fit to your face. You might have trouble staying dry if you have a beard. If you end up with some water in your mask, then there is a valve at the bottom of the mask to drain any water that accumulated. Stand upright to enable the automatic draining of water from the mask. The snorkel stays dry even if submerged. That will save you a lot of salty or dirty water in your mouth which otherwise will lead to gagging and a less than perfect experience snorkeling. The mask is designed to give you a full 180 degree field of view. The window is built with impact resistant polycarbonate. It is fog free. Another great feature of this mask is that it has a mount for your GoPro camera. 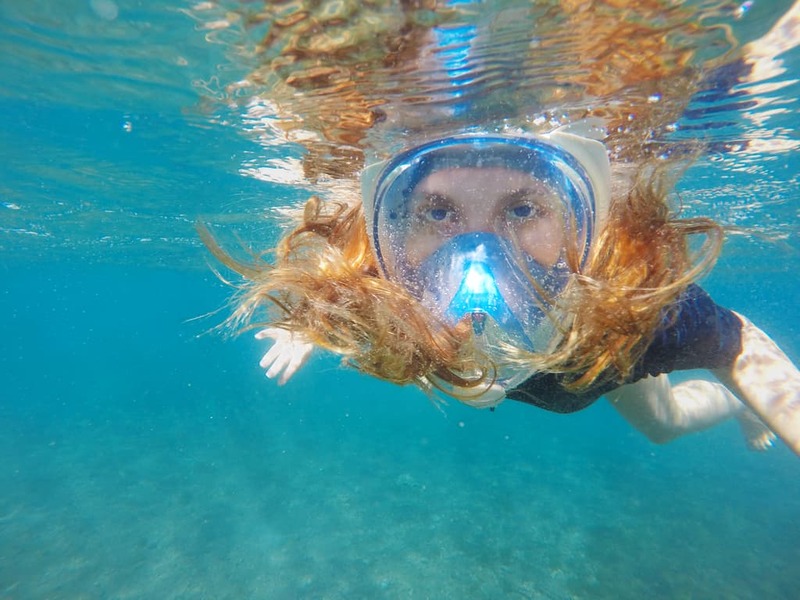 It’s designed to allow you to get an easy view out of the mask onto the viewfinder or the screen of the camera so you can see what you’re filming while you snorkel. 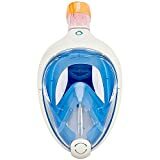 This is a great mask with good features at a good price. We don’t think it’s any better than the Seaview but it’s also not necessarily worse. It only comes in black and the snorkel does not have a color piece that would make it easily visible when you snorkel.